The Royal British Legion's 90th Poppy Appeal was launched today with a special focus on the support for the injured, wounded and bereaved members of the 'Afghan generation' of British Armed Forces. Under the motto, “Put on a poppy”, the national Poppy Appeal was launched at Colchester Garrison with a concert from chart-topping pop sensations The Saturdays for families and personnel of 16 Air Assault Brigade which is currently on combat operations in Afghanistan. The 2010 Appeal has a fundraising target of £36m, up from the record £35m raised in 2009. Despite the current economic times, we trust the great British public will show their support for those who have sacrificed on behalf of their country. We call on the nation to give generously and to wear their poppies with pride. Emma-Jayne Webster, the fiancee of a young soldier who was killed in Afghanistan last year, and Gunner Mark Stonelake, a soldier who lost a leg fighting in Afghanistan, also attended the launch. Both feature on this year’s Poppy Appeal posters at more than 6,000 locations across the UK and on national television ads. Colchester Garrison is future home to one of four Personnel Recovery Centres that are being built by the MOD in partnership with Help for Heroes and The Royal British Legion, who will help support the running of the centres in partnership with the British Army in the future. The Legion will also build, equip and operate the Battle Back Challenge Centre for adventure training and adaptive sports. We are confident the British public will support this important work enough to provide us the means to provide for our injured heroes,” said Mr Thompson. It’s great to be back in Essex performing for the families living at Colchester Garrison. 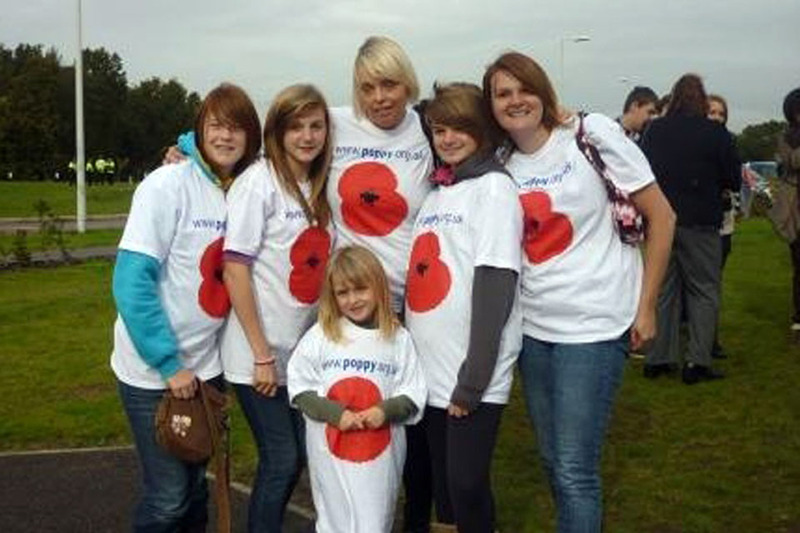 I really admire and respect our Armed Forces and their families, I think what they do is incredible. It’s humbling to be asked to help launch this year’s Poppy Appeal. We will do anything we can do to support the Poppy Appeal and our brave Armed Forces and their families. The Royal British Legion is the leading UK charity providing direct, practical support to the British Armed Forces heroes and their families. The past nine years of conflict have increased the need for our help, both today and for years to come. As serving soldiers, we know all too well how important the Poppy Appeal is for the support of today’s Armed Forces and we are very proud to be a part of it. With the assistance of British Forces Broadcasting Service (BFBS), the Poppy Appeal launch also arranged for video messages from soldiers serving with 16 Air Assault Brigade to be relayed to some 800 family members watching from inside the Corporal Budd VC Gymnasium at Colchester Garrison. See BFBS at Related Links. We represent one-third of all the appeals for higher compensation payments for injuries suffered in Afghanistan,” Lt Gen Kiszely added. “And our campaigns have led to increased compensation awards which have placed an extra £12 million in the pockets of the most seriously injured. The Legion currently spends more than a £1.4m a week or over £200,000 a day in its work helping 160,000 members of the Armed Forces Family each year. Its help is available to all those in the Armed Forces, all who have served in the past, and their dependents.